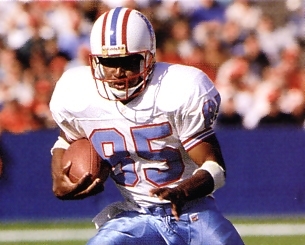 The Houston Oilers were well established by 1991 as the NFL’s most prolific passing team. Under second-year Head Coach Jack Pardee, they operated a run-and-shoot offense that had 34-year-old QB Warren Moon (pictured at right) throwing early and often to a talented stable of wide receivers that included Drew Hill, Haywood Jeffires, Ernest Givins, and Curtis Duncan. They were off to a 4-1 start as they took on the New York Jets on October 13. The Jets, coached by Bruce Coslet, were 3-3 after having won their previous two games following three straight losses. QB Ken O’Brien, in his eighth season, was a steady if not spectacular performer and he had two good targets in wide receivers Al Toon and Rob Moore. RB Brad Baxter had outperformed the team’s 1990 first round draft choice, Blair Thomas. There were 70,758 fans in attendance on a cloudy day at Giants Stadium in the New Jersey Meadowlands. They saw the Jets take the opening kickoff and roll 80 yards in 10 plays. O’Brien completed four passes, including one for a 34-yard gain to Baxter to the Houston three yard line. From there, Baxter ran up the middle for the final three yards and a touchdown. The Oilers went three-and-out on their initial possession and the Jets came back to score again. O’Brien started the drive off with an 18-yard completion to Toon and later threw to WR Chris Burkett for 23 yards to the Houston seven. New York wasn’t able to punch in for another TD, but the 59-yard possession ended with Pat Leahy kicking a 21-yard field goal to make it 10-0. In the second quarter, Houston finally got something going on offense. The Oilers converted a fourth-and-one play at the New York 31 with a Moon pass to Haywood Jeffires (pictured below) for nine yards. Throwing on every play, Moon finished off the 10-play, 54-yard series with a three-yard TD pass to a diving Curtis Duncan in the end zone. Ian Howfield missed the extra point attempt, however, and the score remained 10-6 in favor of the Jets. Following a New York punt, the Oilers took over at their 17 and Moon immediately threw to Jeffires for 35 yards. The drive went 83 yards in 10 plays with Moon converting two third downs with a 21-yard completion to Jeffires on third-and-five at the New York 43 and a 14-yard pass to Drew Hill in a third-and-six situation that made it first-and-goal at the four. RB Lorenzo White finished off the possession by taking a pitchout for a one-yard touchdown. This time the point after was successful and Houston was in front at 13-10. New York had to punt again following its next series but Moon was intercepted by DB Lonnie Young to give the Jets a last shot with 21 seconds before the half and the ball at the Houston 47. Two O’Brien completions got the ball to the 34, but Leahy’s 52-yard field goal attempt sailed wide to the right and the Oilers maintained the three-point lead at the intermission. Starting at their own six yard line after a short kickoff return to start the second half, the Oilers moved the ball effectively with Moon hitting on passes of 16 yards to Hill, 13 yards to Jeffires, and 9 more to Jeffires again to start the drive. But after reaching the New York 44, Moon was intercepted by CB Mike Brim, who returned it 13 yards to not only stop Houston’s drive but also give the Jets good field position. New York made the most of it, moving methodically down the field in 14 plays that ended with Leahy booting a 31-yard field goal to tie the score. Moon had the Oilers driving again as the third quarter came to an end, but the drive stalled at the New York 32 and the attempt to convert a fourth-and-seven situation ended with an incomplete pass intended for WR Ernest Givins that was broken up by Lonnie Young. The Jets went three-and-out on their next possession and Houston again came out throwing with Moon going to Jeffires for gains of 14 and 35 yards to the New York 27. An apparent touchdown run by White was nullified by a holding penalty, but the Oilers scored on Howfield field goal of 23 yards to move back in front at 16-13. New York was unable to move the ball on its next series, even after retaining possession when a punt hit Houston DB Marcus Robertson on the arm and was recovered by Burkett for the Jets. Still, a second Louie Aguiar punt went out of bounds at the Houston six, and with just under six minutes remaining there was still time for the Jets – if they could get the ball back. White ran for a two-yard loss on Houston’s first play, but then Moon threw to Duncan for nine yards and, in a big third-and-three situation, hit Duncan again for 23 more yards. White ran for 11 yards and then Moon passed for eight before handing off to White three more times for short gains while the Jets used their first two timeouts. But on third-and-four, Moon threw to Hill on a crossing pattern and the wide receiver went all the way for a 37-yard touchdown. It was the clincher for Houston – the Jets drove to a last-play touchdown as O’Brien passed to Burkett from 18 yards out, but time ran out on New York. The Oilers came away with a 23-20 win. Houston significantly outgained the Jets (436 yards to 279) and had the edge in first downs (25 to 21). Neither team ran the ball effectively, with New York gaining 43 yards on 21 attempts and the Oilers compiling just 27 on 15 carries. The Oilers sacked O’Brien four times while Moon was sacked once by the Jets. Houston also turned the ball over three times while New York suffered just one turnover. Warren Moon went to the air 50 times and had 35 completions for 423 yards with two touchdowns and two interceptions. Haywood Jeffires led the receivers with 13 catches for 186 yards while Curtis Duncan added 8 receptions for 67 yards and a TD and Drew Hill (pictured below) pulled in 6 passes for 80 yards and a score. Lorenzo White led what there was of a running attack with 24 yards on 11 attempts that included a TD. For the Jets, Ken O’Brien completed 24 of 42 passes for 269 yards with a TD and one intercepted. Chris Burkett caught 6 passes for 81 yards and a touchdown and Al Toon also had 6 receptions, for 51 yards. Brad Baxter had 31 yards and a touchdown on 10 rushing attempts. Houston did indeed win the next week against the Dolphins and made it to 7-1 before losing again. The Oilers did lose three of their last five games, but after having been a Wild Card team the previous four years, they won the AFC Central with an 11-5 record. In the postseason, they once again beat the Jets to get through the Wild Card round but lost a close contest at Denver in the Divisional round to once again come up short of a trip to the Super Bowl. New York was 8-8 on the year but still managed to finish second in the AFC East and qualify for a Wild Card spot. 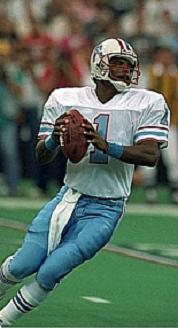 Filling the air with passes on a regular basis, Warren Moon led the NFL in attempts (655), completions (404), yards (4690), but also interceptions (21). Still, his passer rating of 81.7 ranked only tenth and he was fifth in touchdown passes with 23. He was selected to the Pro Bowl for the fourth straight year. Haywood Jeffires led the league with 100 pass receptions and ranked fourth with 1181 yards. He was a consensus first-team All-Pro and also was chosen for the Pro Bowl for the first of an eventual three consecutive times. Drew Hill ranked third by catching 90 passes and seventh in yards with 1109.